We welcome this fine Caturday with the first of two 18-year-old kitties met on the same day, April 12, 2018. Precious resides next to Smokey, who lives, or did, next to Monkey, before his recent passing. Laramie and Lupe are across the street. Those are real names all. Holiday is the other furball from the same block of Alabama. Precious is the seventeenth furball featured in the series from this street. Her home is undergoing renovations, which presented uncharacteristic sighting opportunity. 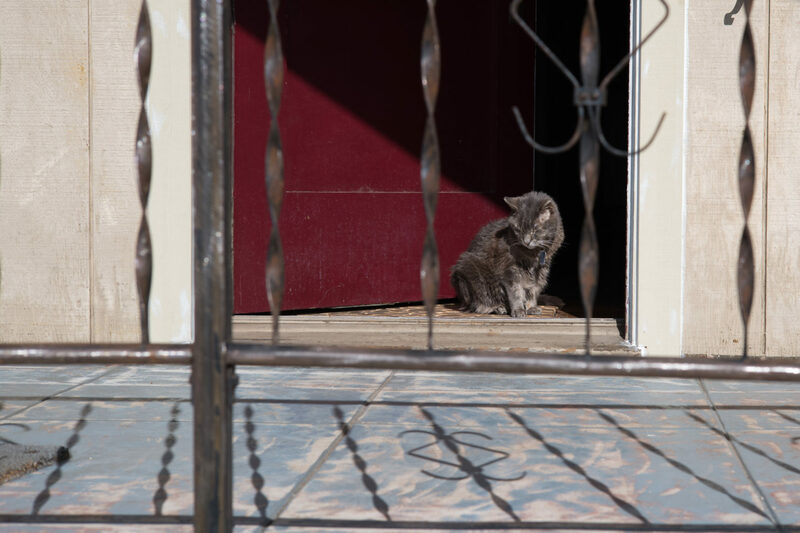 The owner explained that Precious typically suns behind a grated security door, which makes her difficult to see from outside. But with the enclosure temporarily removed, she sunned in the open doorway while he talked to construction workers. The cat’s caretaker asked about my camera, the M10. He hopes to someday purchase a Leica film camera, which would cost much less and better suit his photographic lifestyle. He currently owns a Mamiya medium-format shooter and nine-year-old digicam. The house has a darkroom, where the used film is processed. He expressed the joy and satisfaction of rolling his own film and later developing it. I captured the Featured Image at 4:20 p.m. PDT and its companion two minutes earlier. Vitals, for the first: f/5.6, ISO 100, 1/500 sec, 50mm. Other is the same except shutter speed 1/250 sec. Also in this series: Scruffy, Roly Poly, Woo, Skull, Biscuit, The Colonel, White, Chipper, Frisky, Stretch, Needy, Farfisa, Mates, Hunter, Pee-Pee, Blue, Blue Too, Bonded Pair, Patience, Fess, Jumper, Frenemy, Looker, Cozy, Scout, Lurks, Skit, Mini, Betty, Black and White, Stalker, Bell, Chill, Sammy, Scratch, Poser, Star, Grey and White, Watcher, Herman, Comet, Roman, Willow, Chub, Nimbus, Watson, Lilo, Kit, Pepe, Twilight, Sebastian, Spot, Booger, Ash, Veruca, Riley, Mellow, Bonde, Flower, Glass, Black, BeBe, Fang, Bruce, Siamese, Pounce, Tortie, Haiku, Fraidy, Peso, Daniel Tiger, Dusk, Stride, Dainty, Spry,Tabby, Betty Too, Still, Levi, Shadow, Sophie, Wink, Ferals, Momma, Charlie, Tux, Cool, Benny, Jellicle, Itchy Valentino, Goldie, Nine, Amanda, Siesta, ChaCho, Charlie, Too, Mika, Crystal, Seeker, Mittens, Dancer, Smokey, Monkey, Captain Blackbeard, Season, Maven, Tink, Chunk, Curious, Hanoi, Bella, Tarry, Guido, Maxine, Mr. Kitty, Peohe, Panda, Frankie, Sunshine, Twain, Willow, Too, Brawn, Reddy, Burglar, Laramie, Lupe, Bright, Tom, Charm, Buddies, Boss, Ohana, Seer, Fresh, Token, Lola, Carl, Bramble, Finny, Cal, Tipsy, Zander, Mew, Penny, Charlie (the Third), Bob, Apple, Persepolis, Sebastian, Too, Holiday, Snow, Desire, Luci, Torbie, E.T., Bushy, and Cali.